LinkedIn Pulse: The news and insights you need to know iPhone, iPod Touch, and iPad app creates a customized feed of business news for easy sharing to your LinkedIn network. It integrates your current LinkedIn groups, interests, and sharing habits to help you identify appropriate news and information providers to enhance and expand your career. You sign in with your LinkedIn credentials, and you move straight to an interface to determine curated news groups to follow. Since the LinkedIn Pulse iPhone app bases its preliminary suggestions on your existing LinkedIn footprint, your first round of selections will be different from mine. My choices include traditional news organizations like AP, NPR, USA Today, and The New Yorker, as well as business news resources like Harvard Business Review and Entrepreneur. Technology and online news providers including Gizmodo, lifehacker, Mashable, and Business Insider are also suggested. At the top of the list of selections, you will find influencer to follow LinkedIn influencers. You tap the plus icon in the upper right corner of each logo to add to your feed. 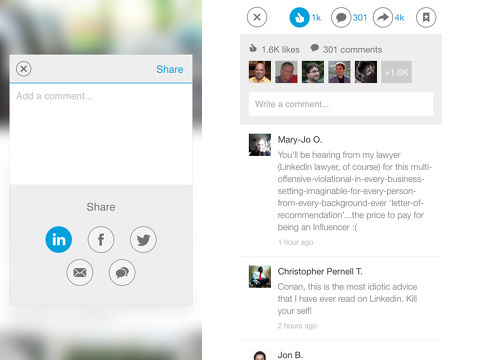 The LinkedIn Pulse iPhone app feed is neatly organized and visually compelling. The top menu bar is black, and the rest of the screen’s background is white. The top black menu bar provides one touch access to your saved stories in the upper left hand corner. At the right side of the black menu bar, you can enter a manual search for articles. The blue icon in the middle of the screen turns on an additional menu bar to create lists. The list tool is helpful, but it is not necessarily as functional as it should be. It would be great to attach a keyword search to a list. For example, if you are trying to qualify a lead, you could set up a keyword search for relevant articles to be added to that list for your research. The news feed is organized by news provider against a white background. Each news provider is stacked vertically, and the stories for each provider are organized horizontally. You swipe vertically through your list of news providers, then you scroll through the stories with swipes to the left and right. A thumbnail image with the title is provided. You touch a story to check it out. The image, title, author, and date published is shared at the top of the article. You can add it to your saved stories list with a touch on the bookmark icon in the upper right hand corner. You can comment; like; and share to LinkedIn, Facebook, Twitter, email, and SMS text with a touch. As you move down the screen and deeper into the article, the sharing features form a menu bar at the top of the screen to eliminate additional gestures to engage socially. You can add and explore other content providers by touching the blue bar at the bottom of your LinkedIn Pulse iPhone app feed. The categories include news, technology, business, science, politics, lifestyle, art & design, photography, entertainment, sports, inspiration, food, fun & humor, and gaming. For each category, you may choose from a large number of providers. For technology, there are currently 64 channels like Apple, GigaOM, and Ask the VC. With a few minutes of effort digging into these categories and channels, you will find specialized news. 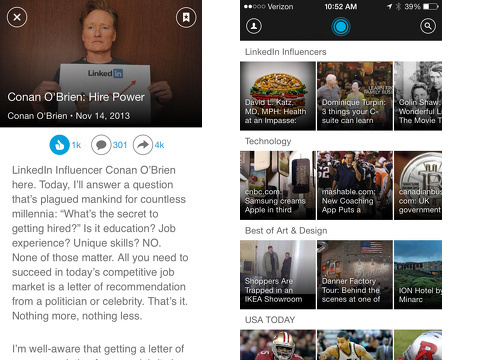 LinkedIn Pulse is a successful news reader iOS app, and it is a complementary tool to the LinkedIn iOS app. The interface for discovering and sharing resources to elevate you professionally is easier and more efficient, yet it is still linked in nicely to your LinkedIn profile. AppSafari review of LinkedIn Pulse: The news and insights you need to know was written by Jenni Ward on November 18th, 2013 and categorized under App Store, Enterprise, Free, iPad apps, News, Productivity, Reference, Social, Universal, Utilities. Page viewed 4499 times, 2 so far today. Need help on using these apps? Please read the Help Page. linkedin is the present and future. Every one need to know how to use this app, is awesome.